BUFFALO, N.Y. — Decades of work on chronic obstructive pulmonary disease (COPD) at the University at Buffalo and the Veterans Affairs Western New York Healthcare System have yielded extraordinary information about the pathogen that does the most harm to patients. The results, published this week in Proceedings of the National Academy of Sciences, provide the first insights into how this pathogen lives and adapts to its host in real-time over months and even years. "By helping us understand how this pathogen survives in a hostile environment in human airways, this research is helping us develop ways to eradicate the pathogen to improve the lives and health of people with COPD," said senior author Timothy Murphy, MD, SUNY Distinguished Professor and senior associate dean for translational research in the Jacobs School of Medicine and Biomedical Sciences at UB. Human airways include the nose, nasal cavities, the mouth, larynx, trachea and bronchial passageways. The pathogen, nontypeable Haemophilus influenzae (NTHi), is the source of much of the misery that COPD patients endure, Murphy said. It is an exceptionally formidable adversary, he added, because strains adapt to each host. Having taken samples from 192 Western New York patients with COPD, he said, meant that researchers then had 269 different strains of the pathogen to study. "People with COPD carry this organism in their lower airways for months to years," Murphy said. "And since it's a pathogen that doesn't belong there, it causes all kinds of problems. "It's a hostile environment: The little hairs called cilia are continuously trying to get it out of the airway; that's what makes patients cough. The immune system is bombarding it with antibodies and macrophages that are trying to eat it up, and with antimicrobial peptides, small molecules that are looking to punch holes in the bacteria. All of these things make it a challenge for these bacteria to live in the human airways." And yet they do survive and even thrive. To find out why and how NTHi survives, and how it might be overcome, Murphy and his colleagues were awarded a National Institutes of Health grant in 2013. It was part of a continuous 28-year-long grant from the NIH to Murphy and his longtime collaborator, Sanjay Sethi, MD, professor and chief of pulmonary, critical care and sleep medicine at the Jacobs School and a co-author on the paper. "Studies of this pathogen up until now have been looking at strains grown in labs or stored in freezers," said Murphy. "The power of our study is that we have 269 strains of the pathogen and we can see what it looked like when the patient first acquired the strain and how it changed its genes to survive in the unique environment of the human airways," he said. Those genetic changes are key, he said, to determining where the pathogen's vulnerabilities lie and what the best strategy might be to eradicate it. The ability to efficiently sequence the genome of the pathogen and analyze it was critical to the success of the research, Murphy added. "Not only were we able to look at what the genes looked like when the patient acquired the pathogen, but we followed these patients every month," he continued. "One bacterium lived in a patient for four years. The genomes are like a looking glass, revealing the pathogen's secrets to us by showing us how it changed its genes through the years. "What we found is that the Haemophilus influenzae turns genes on and off, it's constantly changing which genes are activated based on the environment in the airway," Murphy explained. Since the lower airways are nutritionally deprived, for example, the research demonstrated that the pathogen will activate all of its mechanisms to try and scavenge nutrients like iron that it needs to survive, he said. That information is critical to potentially developing a vaccine or a treatment. "Now that we're beginning to understand how the bacterium is able to survive, we can use these molecules that come from the genes we found as drug targets to eradicate the bacterium from the airways." 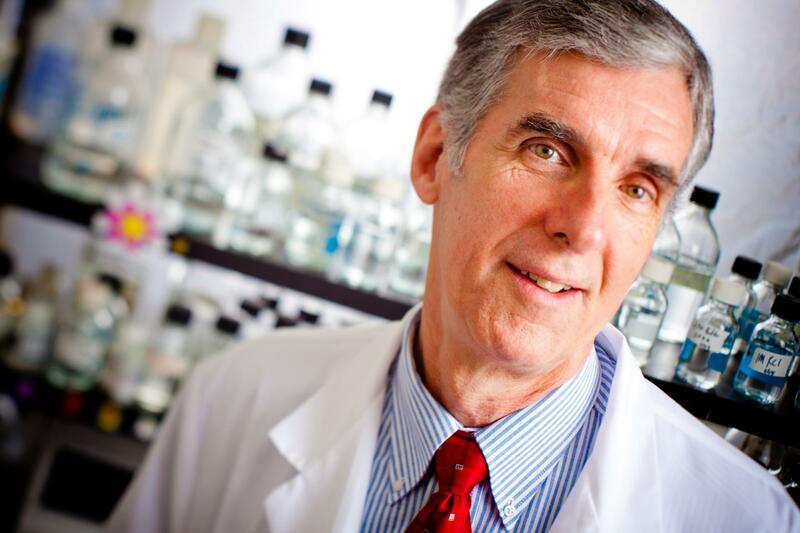 "The beauty of this approach is that a new drug can be targeted specifically to an antigen," Murphy said, "allowing selective eradication of the pathogen without disturbing the normal flora." Murphy emphasized that the work resulted from a true collaboration — not just between him, Sethi and his other UB colleagues, but with his other co-authors. They include longtime research partners Melinda Pettigrew, PhD, professor of epidemiology at Yale University and an expert in the molecular epidemiology of respiratory tract infections, and Hervé Tettelin, PhD, associate professor of microbiology and immunology at the University of Maryland School of Medicine and an international authority on microbial genomics. The majority of the laboratory work was performed at UB, with most of the genomic sequencing performed by the genomics core at UB's New York State Center of Excellence in Bioinformatics and Life Sciences. Both Sethi and Murphy noted the most important collaborators were the 192 patients who visited their COPD study clinic monthly and consistently provided samples to the researchers over the course of the 15-year study. "We are first and foremost grateful to these patients, who received close medical attention while they were contributing to the study and without whom this study could not have been done," Murphy said. Additional co-authors are Christian Ahearn, a PhD candidate in the Department of Microbiology at UB; Mary Gallo, an MD-PhD candidate at UB. Both are performing their thesis research in Dr. Murphy's laboratory. Other co-authors include Janneane F. Gent and Yong King of the Yale University School of Public Health and School of Medicine, respectively; and James B. Munro and Adonis D'Mello of the University of Maryland School of Medicine.